Cars lined the road to Maghera outside Fortwilliam Park in Tobermore as hundreds of supporters finally got the chance to see soccer legend George Best turnout for the local side back in 1984. 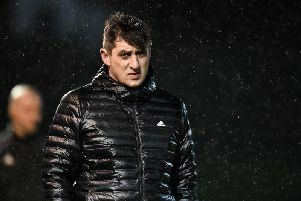 Speculation about whether the former Northern Ireland and Manchester United great would field in the famed red and black of the Tobermore men was rife in the weeks leading up to the game 34 years ago. Eventually, though, the deal was sealed and Best duly arrived at Fortwilliam for the Irish Cup clash against Ballymena on February 11. But there was to be no happy ending on this occasion. Tobermore were duly despatched, the winners showing little emotion in running out 7-0 winners. The Ballymena goal bonanza began as early as the eighth minute when Michael Guy goaled. And, with Best struggling to gain a foothold, there was only ever going to be one result. Still, though, he and Tobermore did manage some moments of control. An occasional strong pass and one shot at goal showed glimpses of past glory from the 37-year-old. Declan Meenan also came close for the South Derry team. However, Ballymena stepped up the pace considerably in the second half when the goals flowed freely. Goals in quick succession soon after the break stretched their lead and by the 58th minute they were 5-0 ahead. Michael Guy and Jonathan Speake completed the rout, although few in the 4,000 strong attendance were too concerned as they concentrated attention on the real crowd-puller of the day, George Best. At no time was this more in evidence that immediately after the game when the Tobermore dressing room was besieged with autograph hunters. Best was said to have dealt graciously with each request before making his departure. And, the Mail report of the day's proceedings summed up perfectly the attraction of George Best - even at the very end of his career. "His appeal was summed up by one young supporter who had watched the game perched on his dad's shoulders behind the goals. As his father made for an early exit, the young boy said: "Just another minute, daddy, he's got the ball again." And obligingly, dad stopped to watch the maestro in action. Two hours after the final whistle, Best was already winging his way to London to catch a flight to Los Angeles and a rendezvous with girlfriend Mary Stavin. For everyone else the memories of that day in Fortwilliam Park have lived on as a fitting legacy of the huge popularity of a footballing great.